Onlywood is a new Pizzeria located down a little alley off of Duval Street. It can be a bit difficult to find unless you know where to look. But if you know where Lobo’s or Antonia’s are located finding Onlywood presents no issues at all. 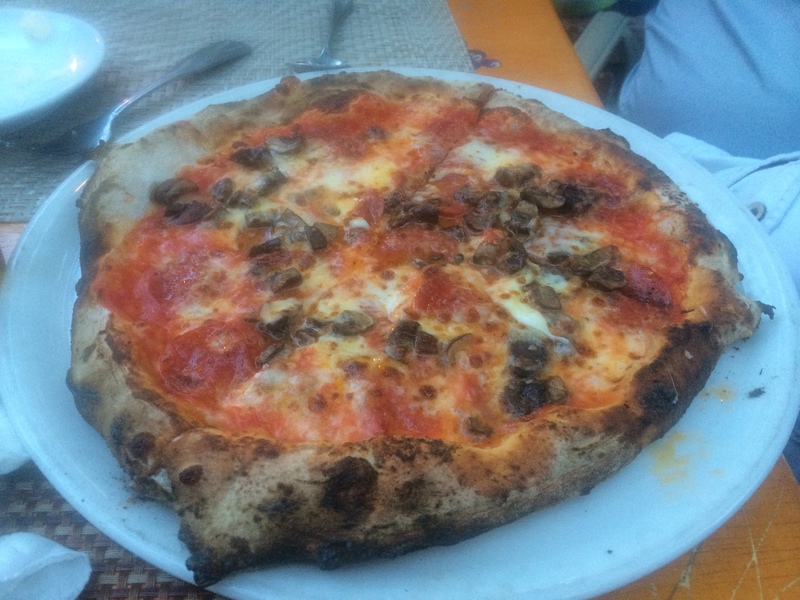 We had our choice of sitting inside or outside, and while initially we wanted to be in the air conditioning, the wood fired oven made the inside so hot that the small window unit could not keep the place anywhere near cool, so we sat outside in the little courtyard. The ambiance out here was lacking, with sad looking plants and burnt plants and awnings, but a little work could really make the area cozy and romantic. Also, the music playing was near awful, very fast paced and not suited for a nice dining experience. 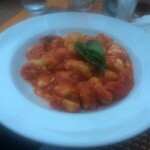 At an Italian restaurant one expects Sinatra or something similar to set the mood and enhance the experience. Once seated and our drink orders taken, we almost felt that we were in Italy as there seemed to be an ice shortage for our drinks. It was probably that the ice could not help but melt in the sweltering dining area and the almost equally hot outside courtyard area. Thank goodness for the breeze and the lack of mosquitos that night. To their credit, the staff which was made up of friendly waiters from all over Europe did replenish our ice regularly. Not being off to a great start with the setting, we were hoping that the food would be better. A couple of bread baskets with dipping oil were brought out to us; it was good Italian bread so I had some hope for the meal. 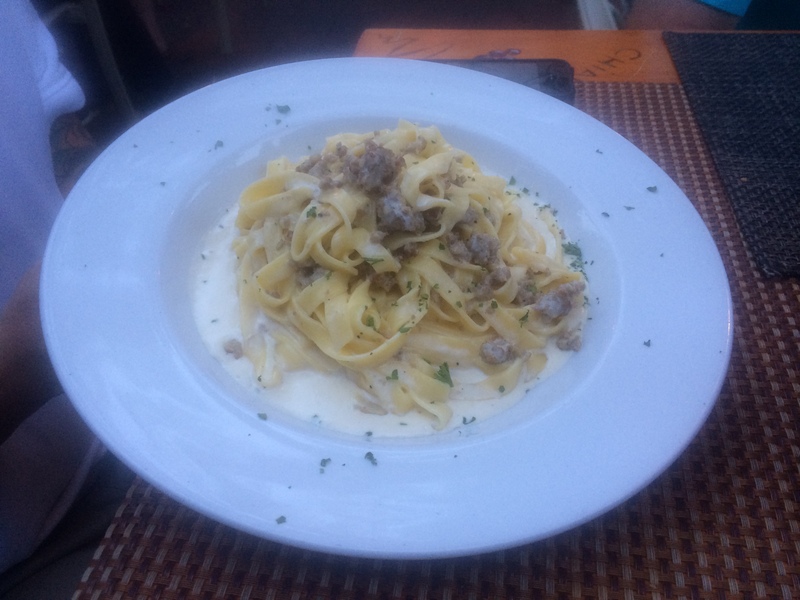 We tried a variety of items on the menu which had everything from salads to seafood and of course pizza and pastas to choose from. To start, we ordered caesar salad, alla caprese salad, and stuzzicarolo which is basically an antipasti platter of Italian meats, cheeses, and bread. The caesar salad was large enough for two to share and while it was not a spectacular salad, it was good and I did enjoy the dressing. The alla caprese with fresh tomatoes, basil and mozzarella was tasty with the help of a little salt. 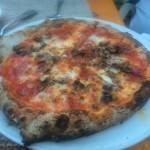 And the stuzzicarolo was delicious with high quality meats and cheeses presented on a wooden cutting board. Our dinner order consisted of gnocchi alla checca, fettuccini panna e parmiggiano, 4 maiali pizza, and pizza with pepperoni and mushrooms. 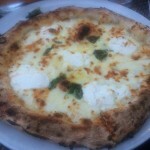 Here the restaurant excelled and made it worth dealing with the other inconsistencies. 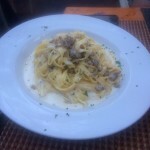 The fettuccini, basically their version of alfredo was creamy, rich, and delicious. 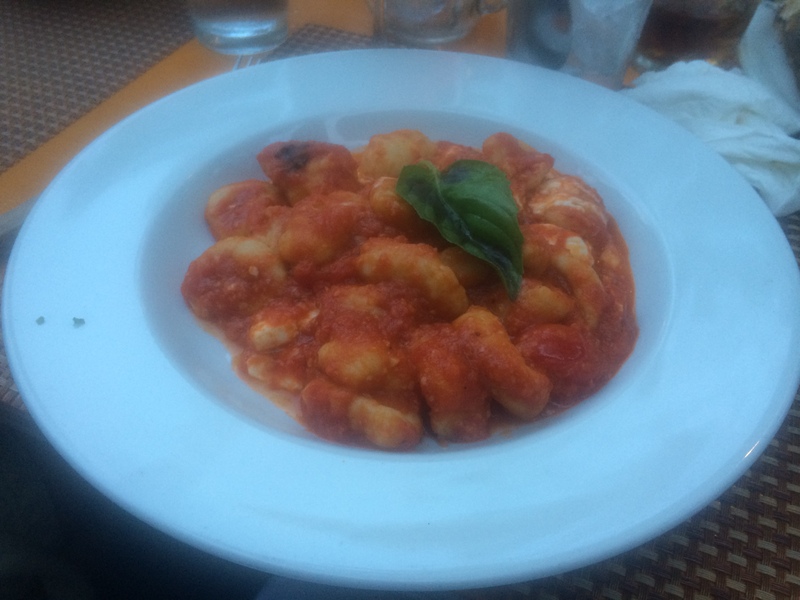 The gnocchi which is a tender potato pasta served with marinara sauce was absolutely mouth watering and the pasta was cooked to perfection. The pizzas were all personal sized and the ingredients were all fresh and delicious taste combinations. 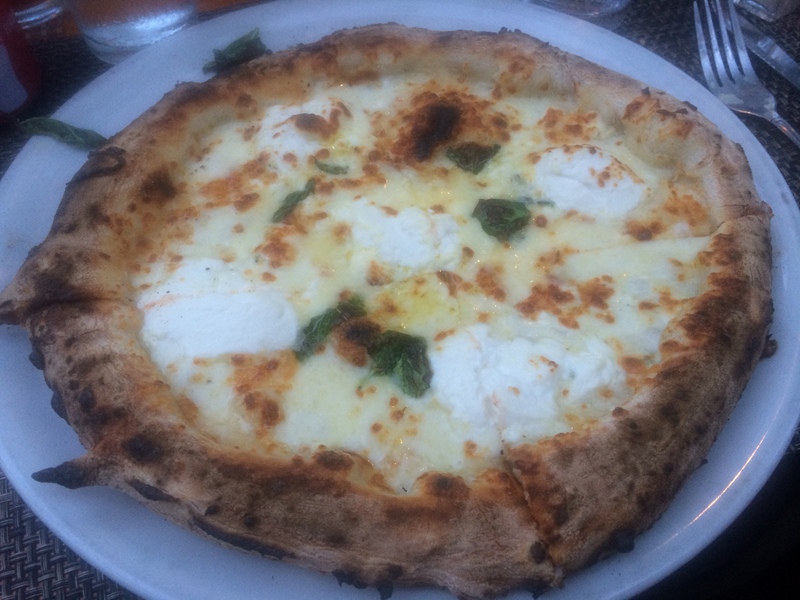 The 4 ,aiali pizza was a white pizza with four cheeses; these can sometimes be bland, but this one was exceptionally tasty with the right amount of garlic to make it a standout. We all enjoyed the food so much that we did not order dessert that we all had so vehemently intended to.